Outlaw ATV Tires - Reviews, Specs, and Best Deals. Outlaw ATV Tires - Buyer's Guide. 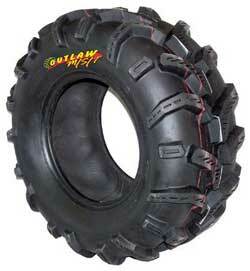 The High Lifter Outlaw ATV tires have become the weapon of choice for a lot of you ATV mud riders out there. We'll run through some of the unique features of this ATV mud tire first. Then we'll tell you where to find the best deals around. New rubber compound with better durability and puncture resistance. Lighter weight for better throttle response, but the strength of a 6 ply rating. 28x10.5x12 is at least 10 lbs. lighter than most of the competition. 28x10.5x12 Outlaw is lighter than most 27x12x12 tires at only 31 pounds. The tread design features a rounded tip, cupped lug, and is 1-1/4" deep for better forward traction. Larger tire footprint on the ground is more resistant to tread tears and lug tip wear, plus offers longer tire life. Tread wraps around sidewall to offer up to 40% more lug area for more traction from the sidewalls than most other ATV mud tires. Large space between the lugs for superior self-cleaning in thick mud. 25-1/2" tall tire height for more ground clearance in the mud than most other mud tires. 28x10.5x12 Outlaw is a full 10.5" wide - The 28x12.5x12 is a full 12.5" wide. Sizes available range from 25's to 31's. 28x9.5x12 tires will fit on the front of a Polaris without rubbing, and the 25"/26" combination work great on a Honda 300 4x4. If you already know that Outlaw ATV tires are what you want - we came up with a customized search that will show you the best deals available right now. It updates automatically so all the prices are current. We talked to riders and dealers, scoured the forums and reviews, and checked owner surveys to get the real story. Below are excerpts from owners in their own words. Excellent for deep slick mud and pull really great thru the deepest ruts due to sidewall wrappings. I love these tires. I have a 2007 Brute force 650 with 27s on it and they are miles ahead of the competition. Really light weight for the size. Unparalleled in mud. Pretty smooth ride for a strictly mud tire. Laughing at your buddies when they're stuck and you're doing circles around them. This is the best tire out there for the mud rider. They won't tear up your four wheeler if you don't ride like an idiot and as long as you keep up with some basic maintenance. You don't have to spin them fast to keep them clean and they bite like no other tire I've seen. Rough ride on hard surfaces. Very hard on axle shafts and related components. Buy these if you want to do ball joints and bushings every 6 months. Causes extreme jealousy. May cause uncontrollable laughter watching others shout profanities at you when you ride through the hole they're stuck in. If you're really serious about ATV mudding then the High Lifter Outlaws are as good a choice as anything on the market right now. Just be aware that this isn't an all terrain tire. If most of your riding is hard packed surfaces with an occasional mud hole - this isn't your best choice. Cutting fenders for more clearance. Lift kit for even more. Gearing change to compensate for bigger diameter tires. Heavier duty parts like axles due to increased driveline strain. Snorkels to prevent water damage. More power due to increased traction and rolling resistance of the tires. So these are serious tires for serious mud. And that's about as serious as we're gonna get. ATV muddin' is about fun - so do what you have to - and dive in! ATV Outlaw Tire - Best ATV Mud Tire?